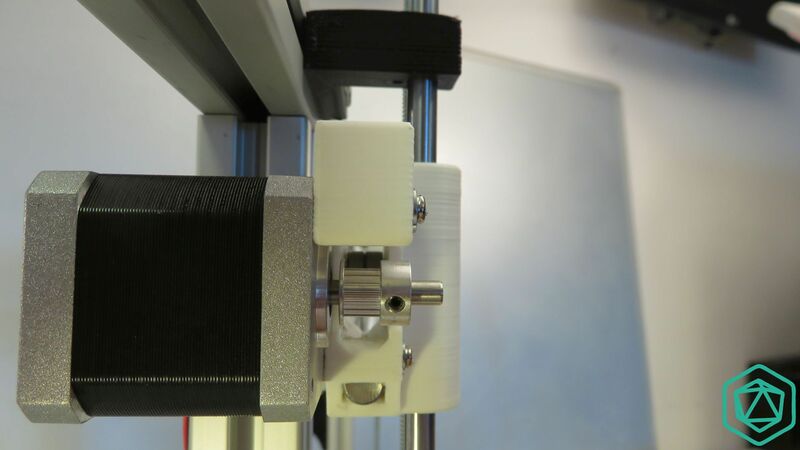 Scalar XL: Push the rods inside the round slot on the plastic part of about 4.3cm . 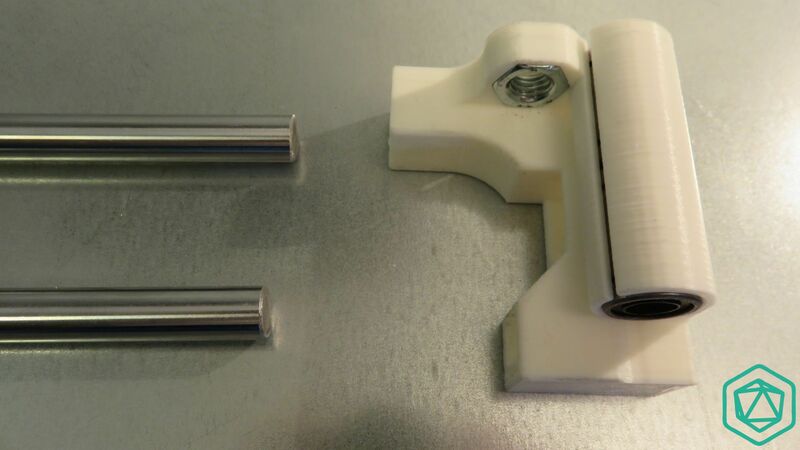 The pictures shows you how much the smooth rod is inside the plastic part. 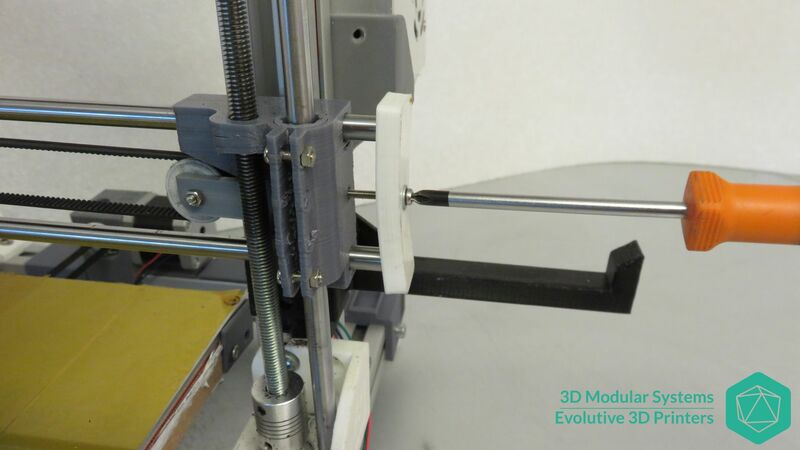 Scalar M: Push the rods inside the round slot on the plastic part of about 2.5cm . 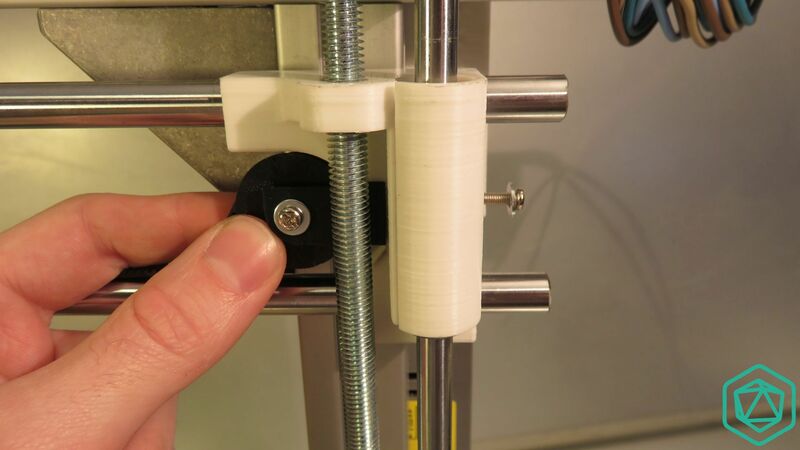 If you struggle in pushing the smooth rod inside , use a hammer and give some small sharp hits on the other side of the smooth rods. They will get inside little by little. 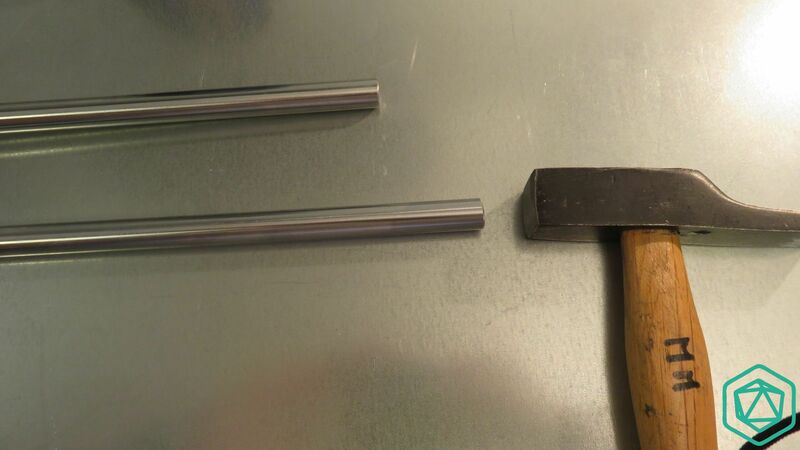 Here the pictures shows 1 smooth rod completely inside and the other one in the process of getting inside. 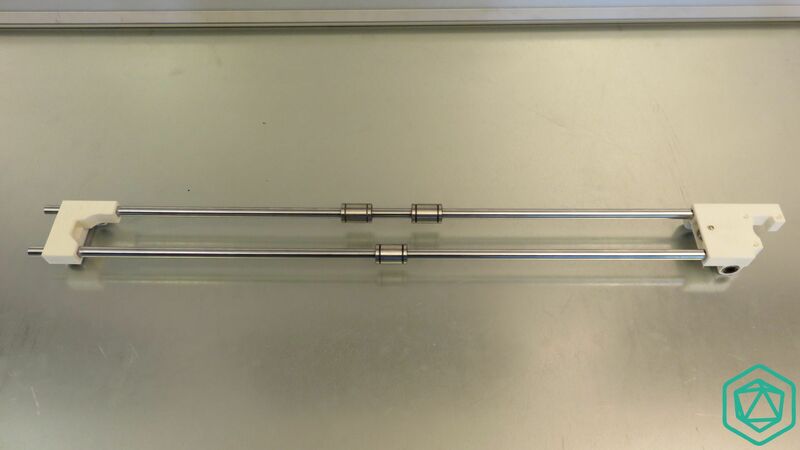 Once both smooth rods are in place, you will have something similar to the picture. 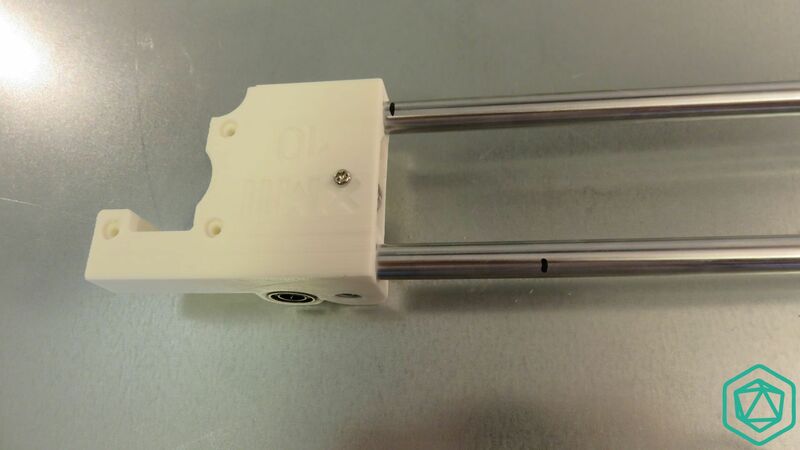 Notice on the picture that the top of the plastic part is indeed at the bottom of the picture. 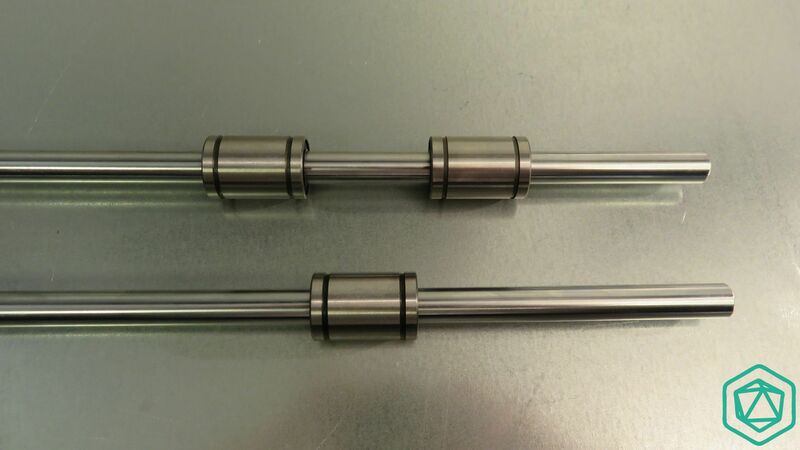 Scalar XL: Once both smooth rods inside their slots, insert 2 x LM10UU bearings on the top rod and only 1 on the bottom rod. 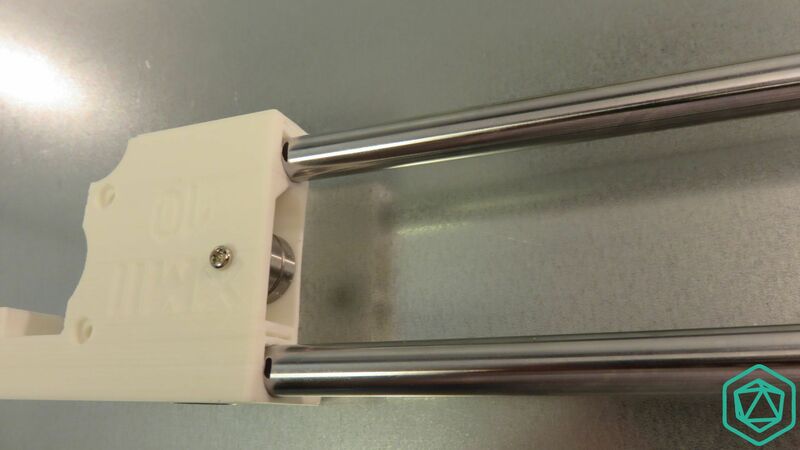 Scalar M: Once both smooth rods inside their slots, insert 2 x LM8UU bearings on the top rod and only 1 on the bottom rod. 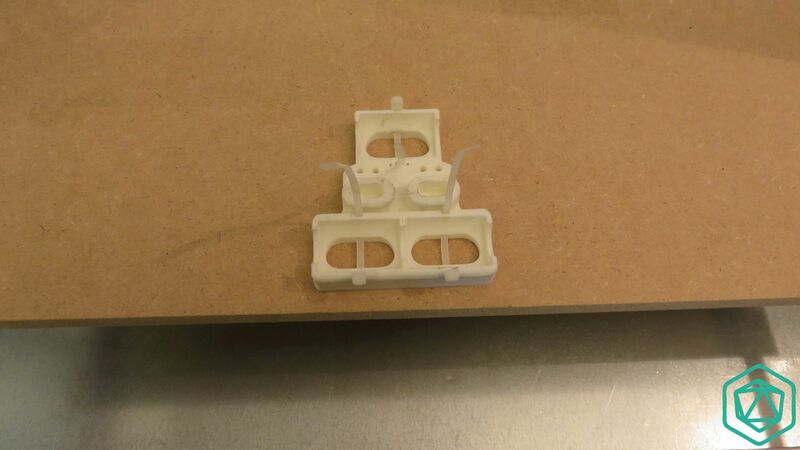 You can figure out what is the top side easily. The marking is made so that when you read it on the proper side. 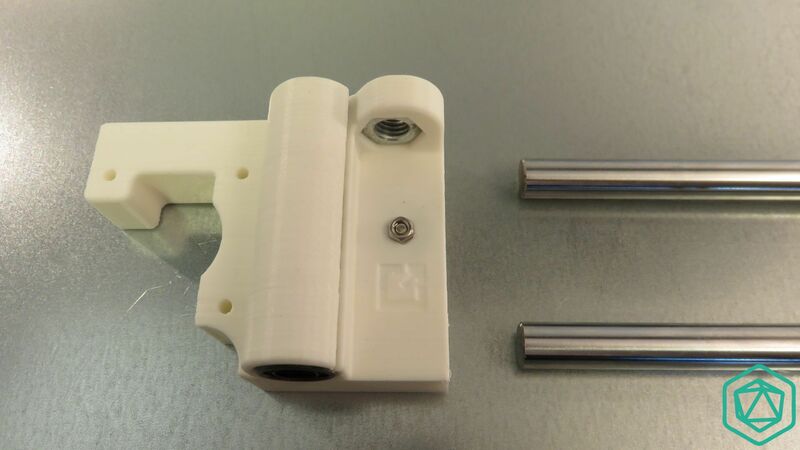 Pre assembled kit: Inside the pre assembled kit, the X carriage will already be mounted with the Linear bearings .You need to position it as shown on this picture. 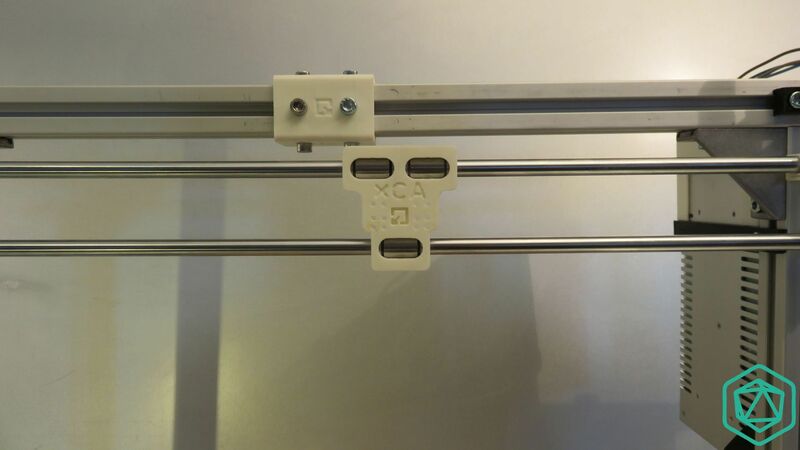 Scalar XL: Once the bearings are in place, take the other plastic part marked XMI 10 And push the available sides of the smooth rods inside. 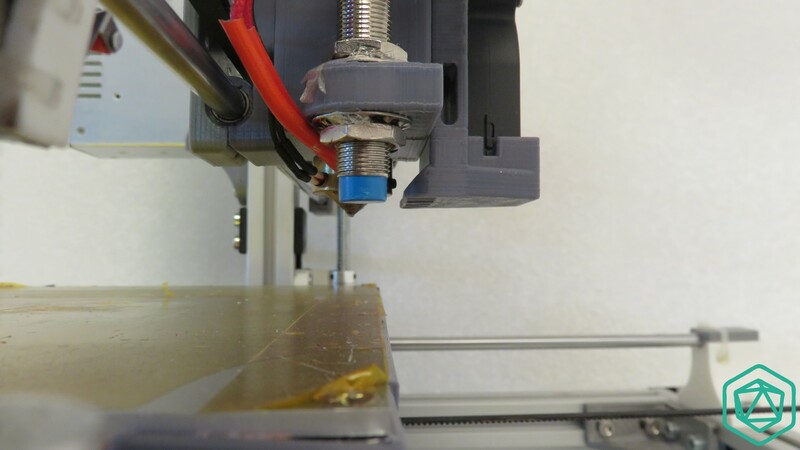 Scalar M: Once the bearings are in place, take the other plastic part marked XMI 8 And push the available sides of the smooth rods inside. This side should be easy to insert. 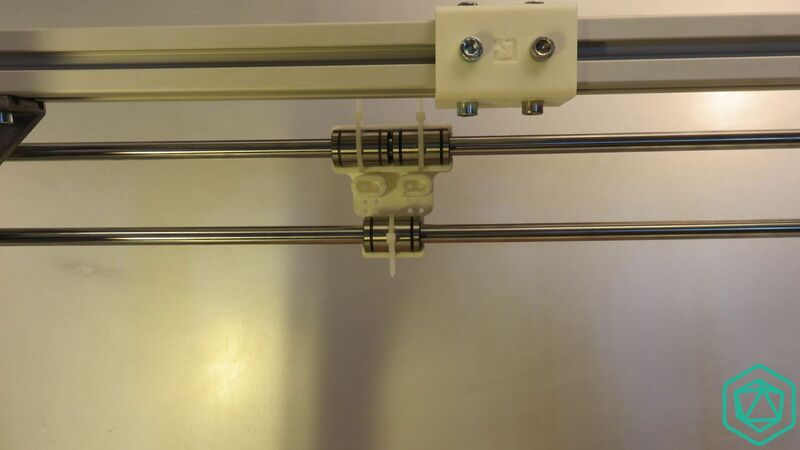 Once the smooth rods inside push the plastic part so that the rods are on the edge of the plastic part. 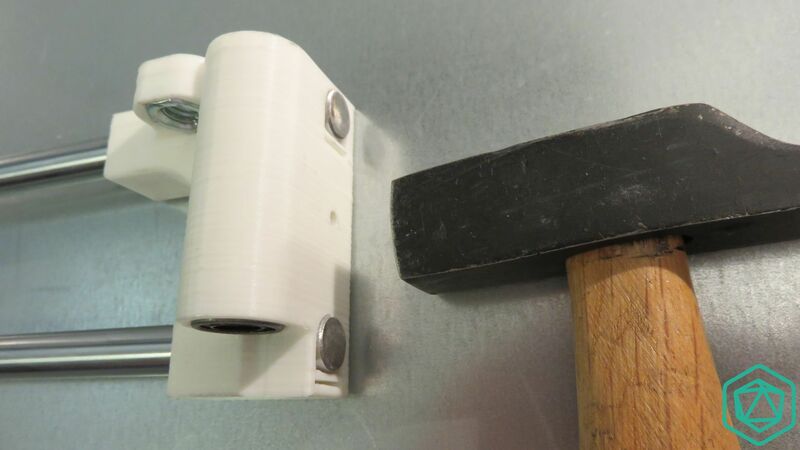 You can use a hammer and hit the middle of the plastic part if you struggle doing it! Here is the result if you have it right. 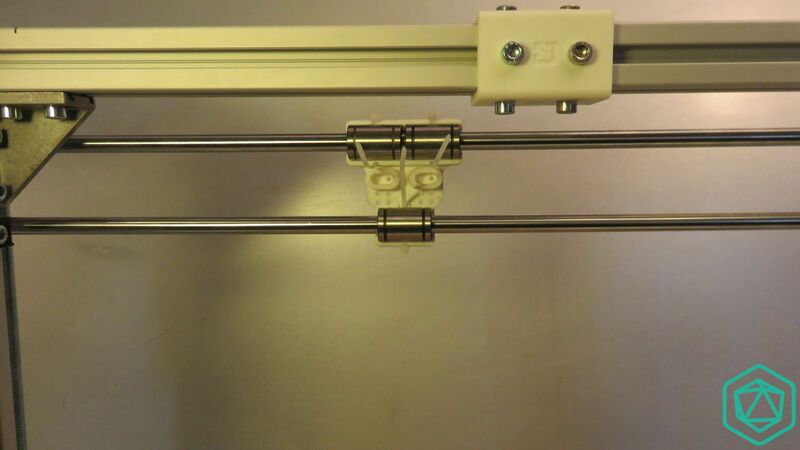 Cette entrée a été publiée dans Axe X, Imprimante Scalar, Imprimante Scalar X10, Scalar XL, et marquée avec assembly, smooth rod, X axis, X axis assembly, le 16 May 2015 par 3D Modular Systems. 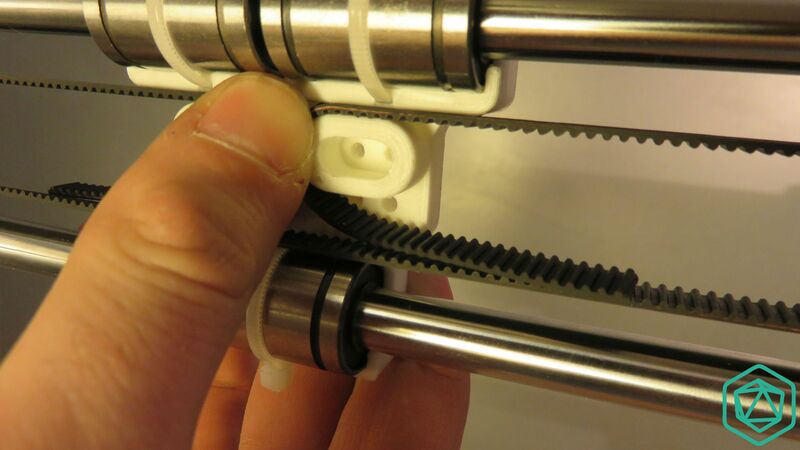 Insert a M3x20 screw + M3 washer and then close the whole system with a M3 nut. If the carriage is already mounted you can scroll down to skip this part. 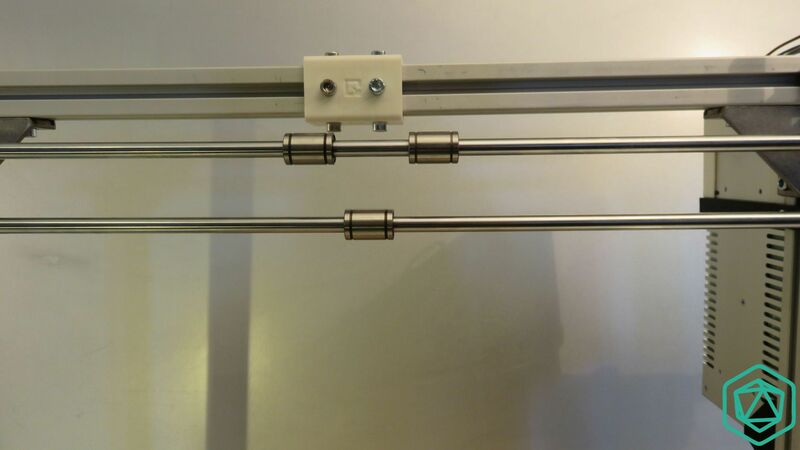 On X Axis slightly space the linear bearings and move them on the center on the axis. 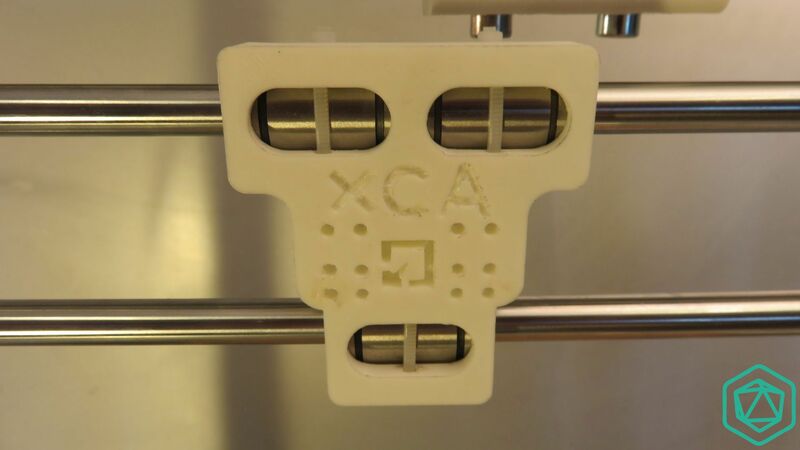 The following steps explain how to assemble the X carriage called XCA 10 for Scalar XL and XCA 8 for Scalar M. You can now check that it properly fit on the bearings. 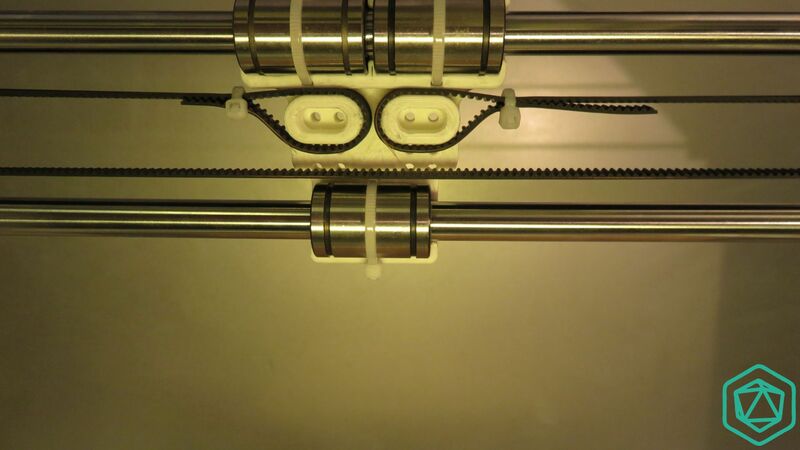 Place on the carriage 3 cable ties. 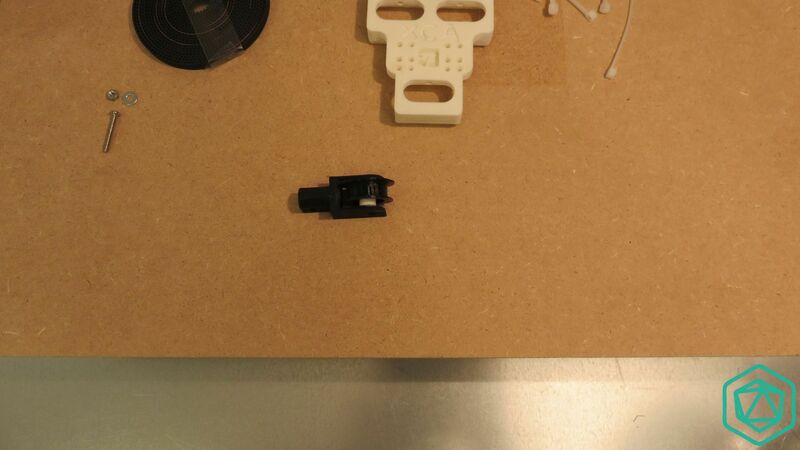 In order to make things easier, be careful to properly place the cable tie heads on the outside of the plastic part as shown on the picture. 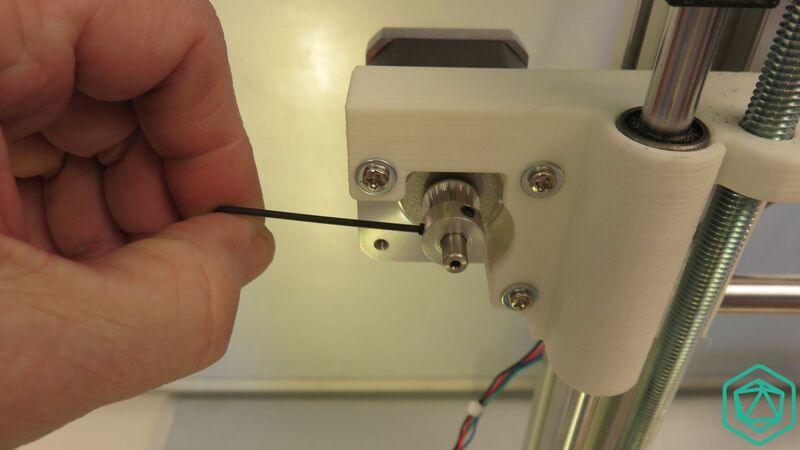 Also make sure the heads have at least 1 or 2cm of free length, this will makes things easier later on when you will tight them up. 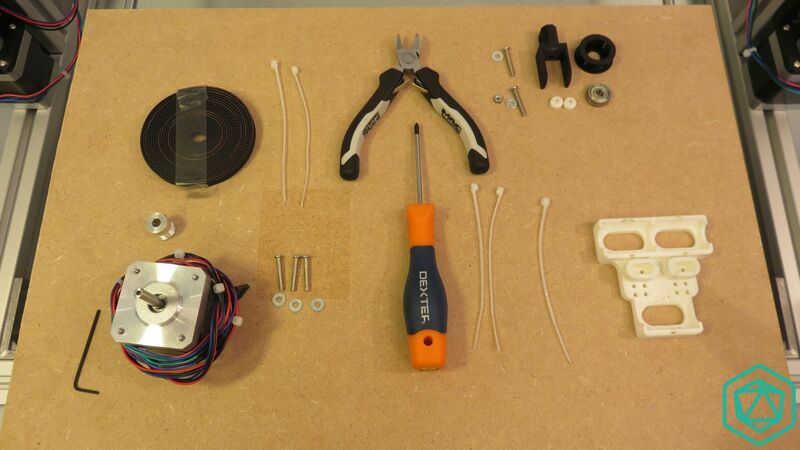 The back view will give you more access to the cable ties and will make it easier to handle them. Tight the cable ties so that the ties heads stay at the outside of the part.This will allows to have more free room for the belt later on. Front view, the carriage looks like the picture. 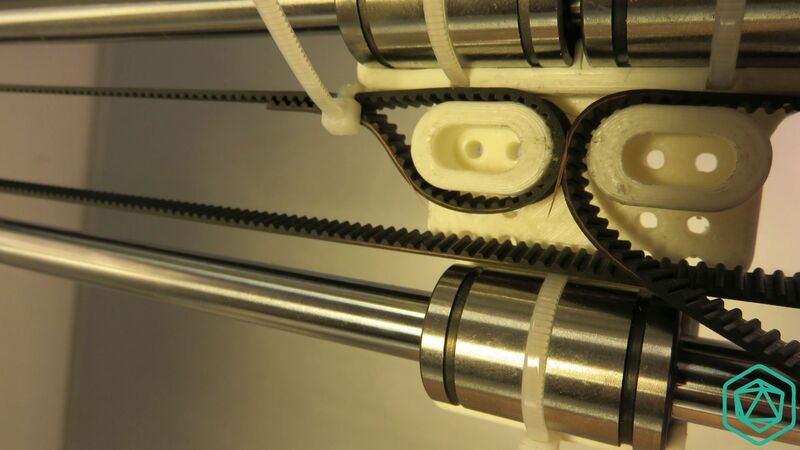 Notice the cable ties that enroll the bearing. 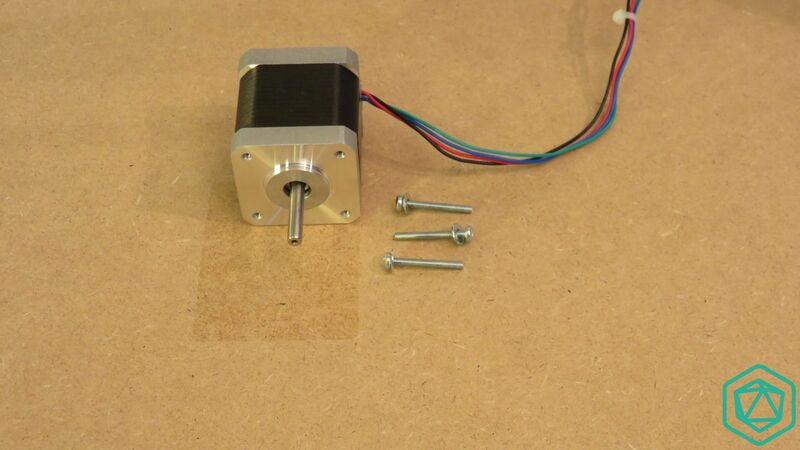 Place the stepper motor on the left of the X axis. 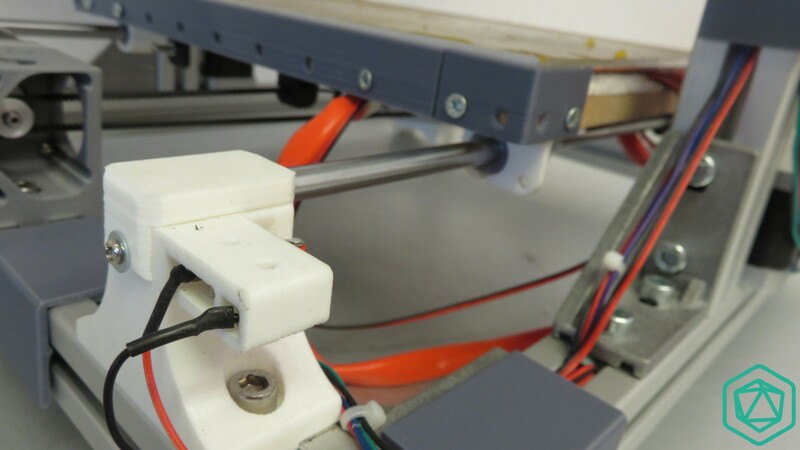 The wires from the stepper motor needs to be oriented toward the machine . Screw it entirely on it’s support. The back view shows you how to position the cables. 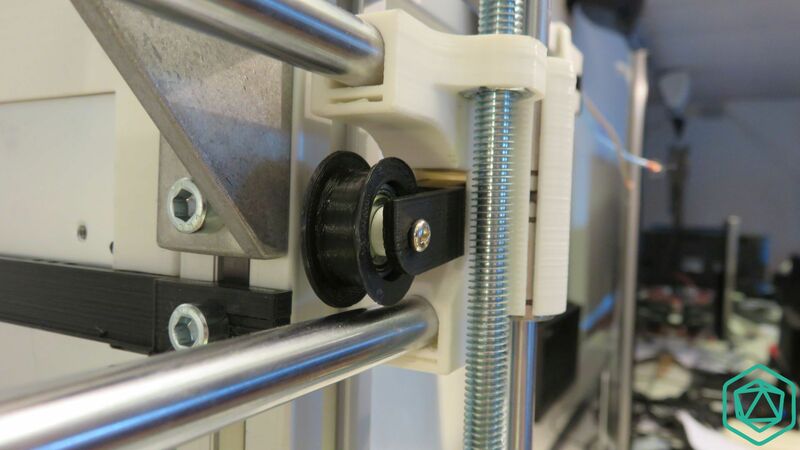 They will then be place inside the aluminum extrusion slot later on. 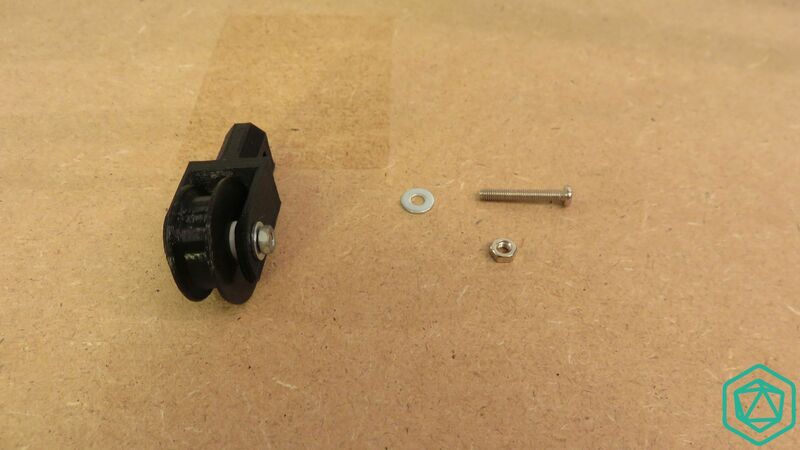 Now , install the pulley on the motor axis. 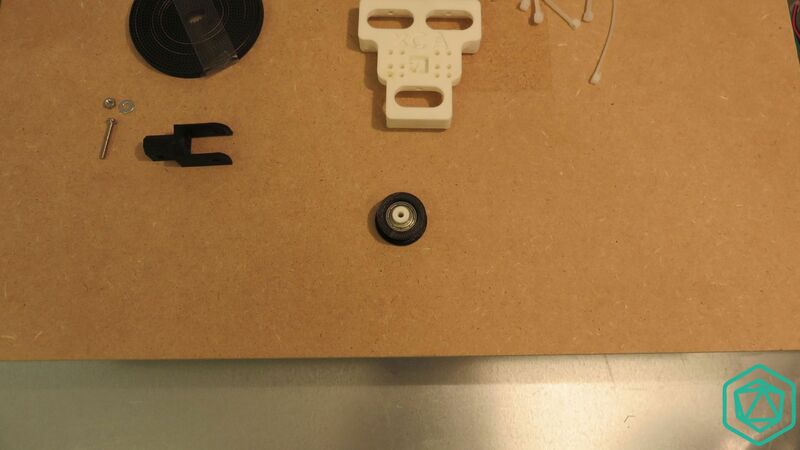 Place it as shown on the picture so that the thicker part of the pulley is facing the opposite of the motor. 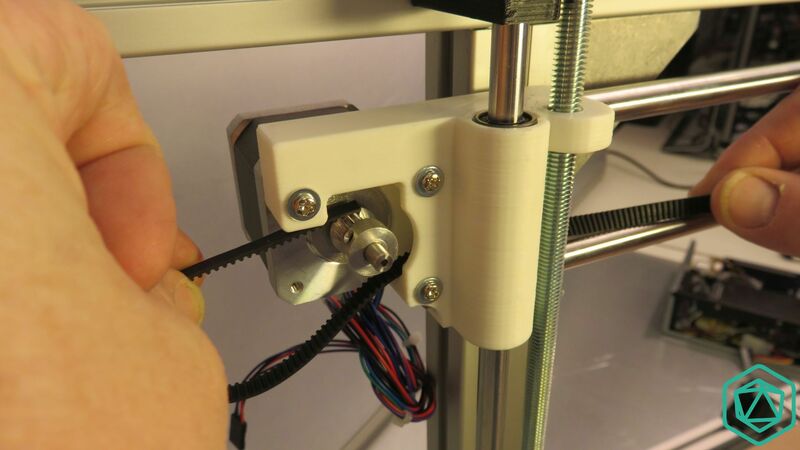 This will allow you to properly align the pulley’s teeth with the belt slot on the stepper motor support. 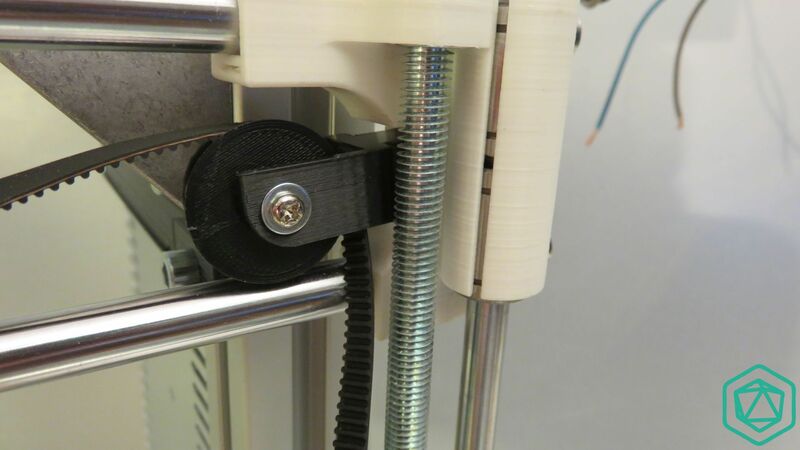 This side you should help you understand how to align the pulley with the belt slot. Now take the belt stretcher that you assembled at the beginning of this chapter. 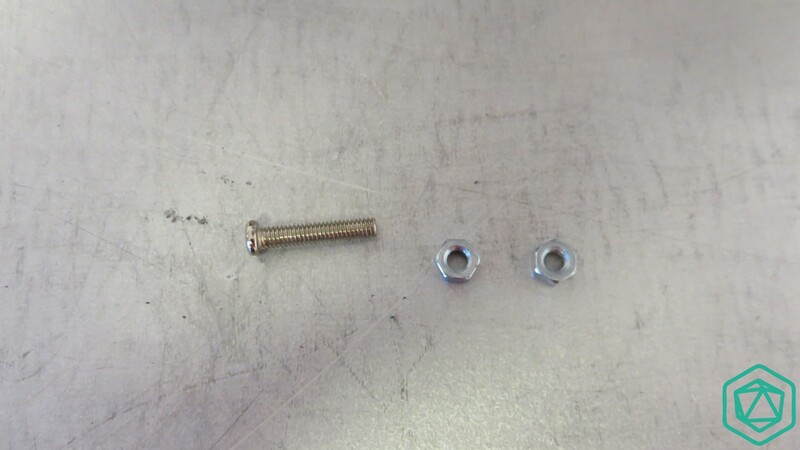 Scalar M: Take also a M3x30 screw, a washer and a M3 nut. 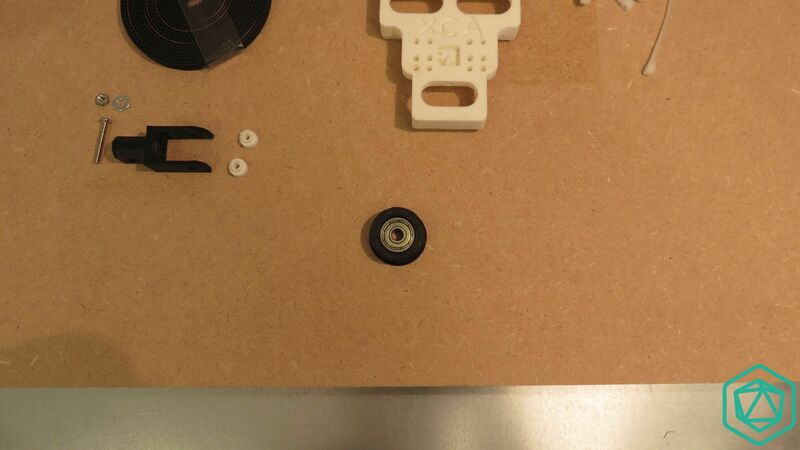 Scalar XL: Take also a M3x50 screw, a washer and a M3 nut. 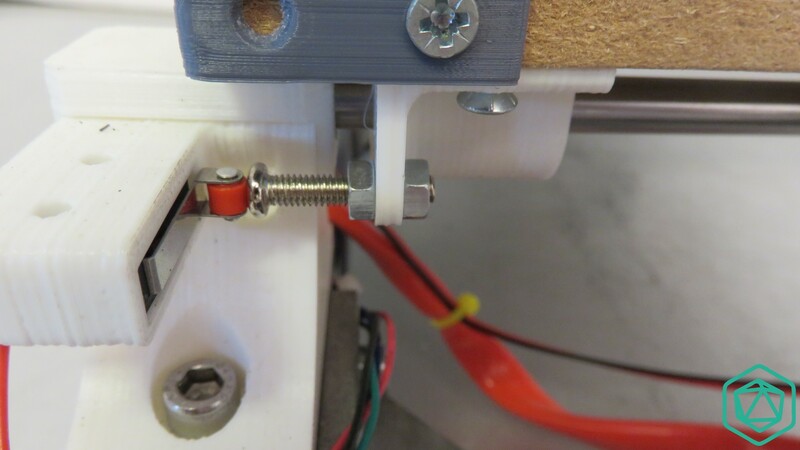 Place the nut inside the belt stretcher, there is a dedicated slot on the side of it. 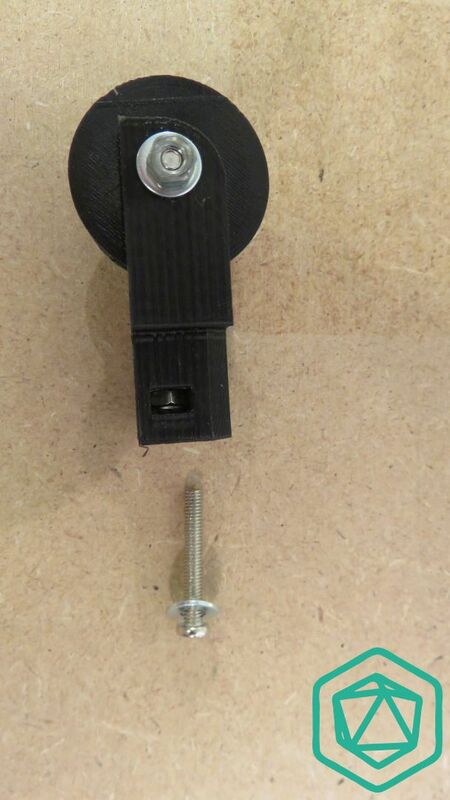 The washer will be mounted on the screw and will help to tighten the stretcher. 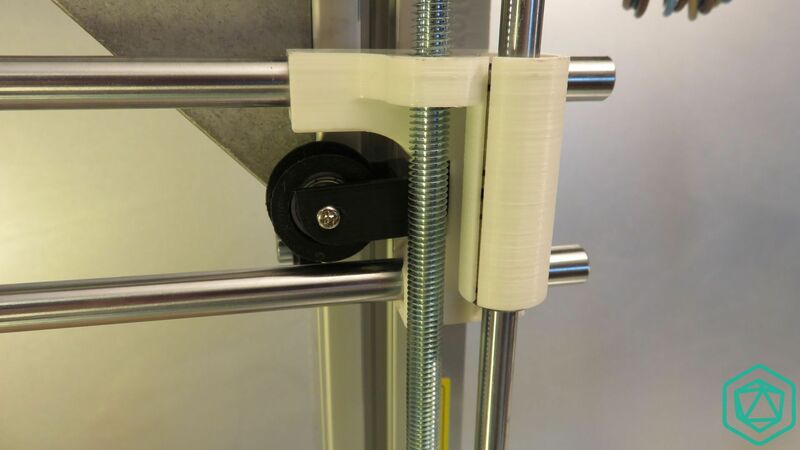 Use the tensioner support and place it at the end of the X axis smooth rods.It’s purpose is to make sure the tensioner will force on the X axis smooth rods ends and not on the Horizontal Z axis smooth rods. 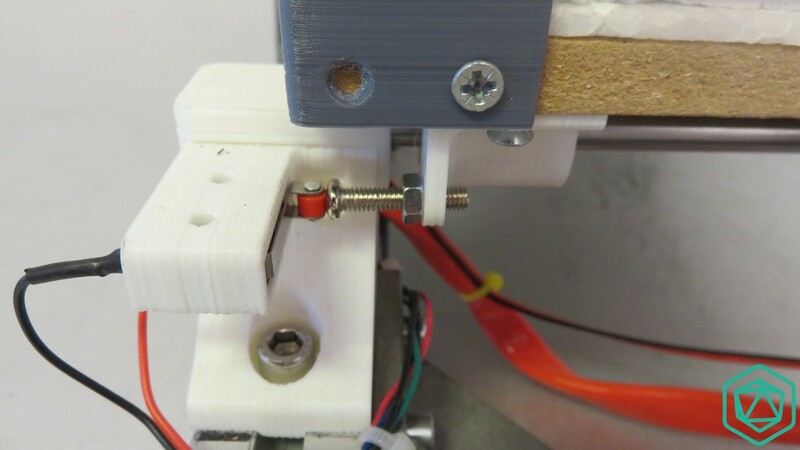 Place the screw and it’s washer on the side of the right side of the X axis. She should be free and be fully inside. 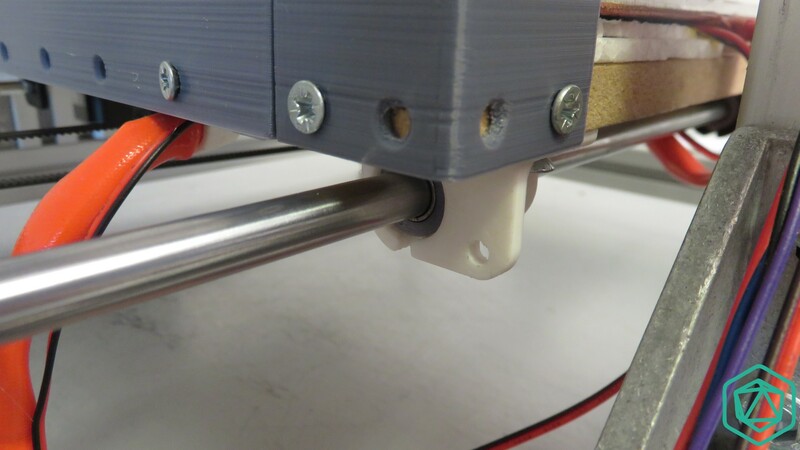 Now place the stretcher inside the dedicated slot on the same plastic part. Notice the triangular shape slot. The stretcher should be able to get inside properly. Slightly screw the stretcher with the side screw. The purpose here is to make sure the stretcher is in place and that we have the maximum amount of possible movement to stretch the belt later on. 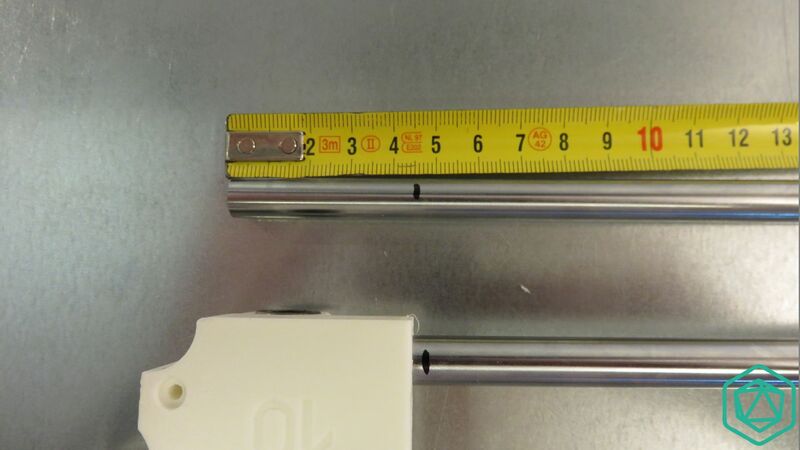 Depending how the belt is provided you will need to cut the 2.5m meter length of it or they will already be provided with the proper length. 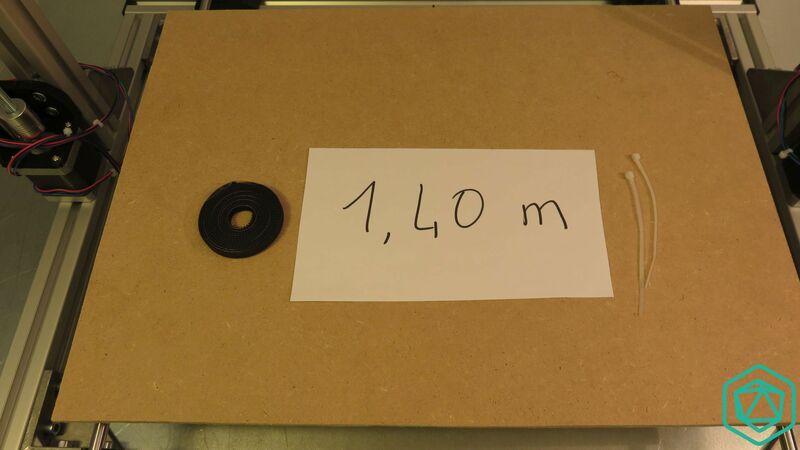 Take the 1m40 belt (cut the 2.5meter belt at 1m40 if the belt is provided uncut). 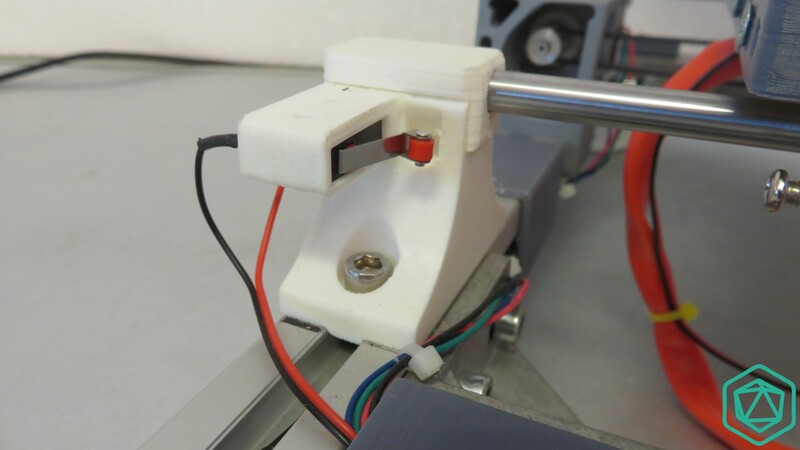 Insert the belt inside the slot of the stepper motor holder plastic part. Insert it at the bottom of the bearings, the belt’s teeth facing the bearings. 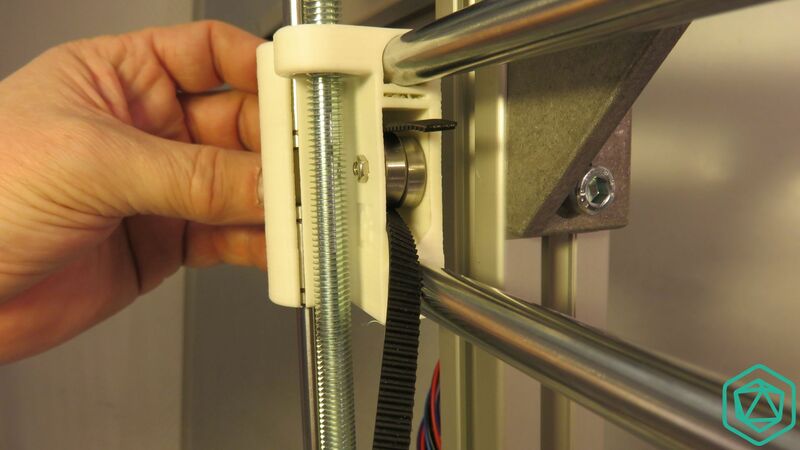 On the other side, handle the belt so that it goes around the pulley. With the belt’s teeth always facing the pulley. Take care to push the belt on top of the bearings. 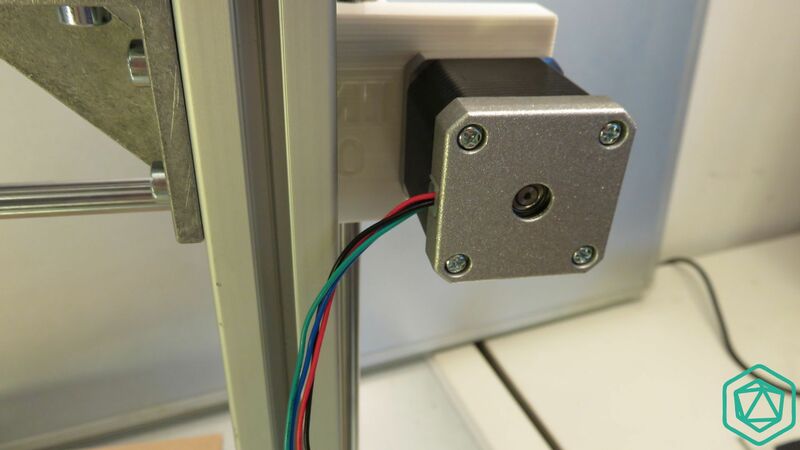 The bearing will keep the belt straight to the X axis carriage so that when the motor pull or push the belt, it’s always rectilinear and parallel to the smooth rods. 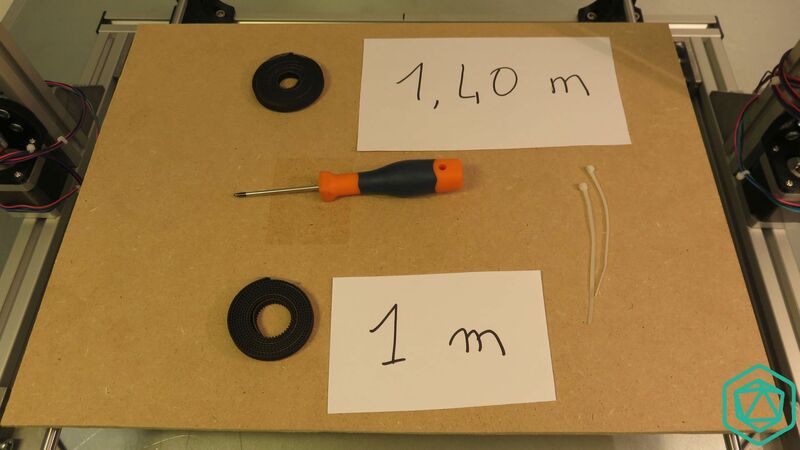 Then pull the belt so that at least 10cm are available in the void. 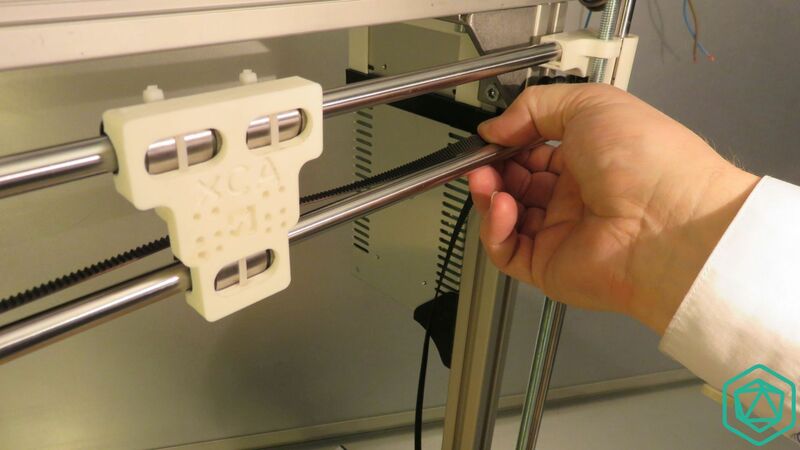 Now go the other side of the X axis, and take the bottom part of your belt. Push it behind the X carriage. Now insert it behind the stretcher. If you struggle you can unscrew the stretcher, pass the belt and then screw back the stretcher. Here is a picture of the belt once inserted behind the stretcher. Bring both ends of the belt together. 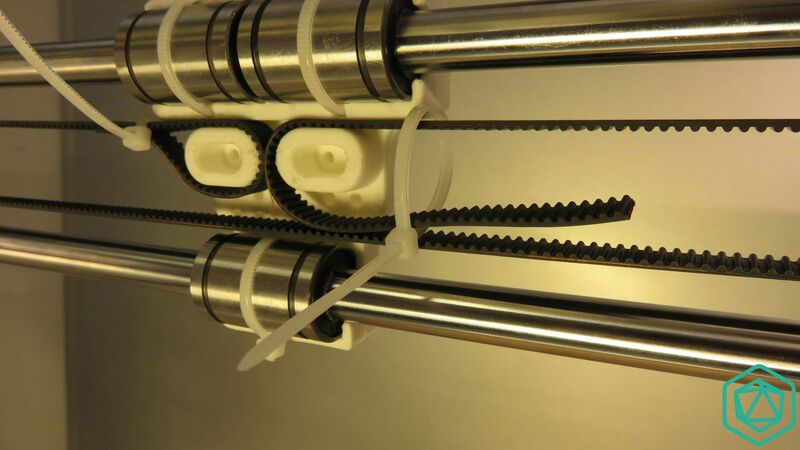 Those 2 ends must be located at the top of the overall belt assembly. If you have the proper length, the belt should slight cross with enough free belt. 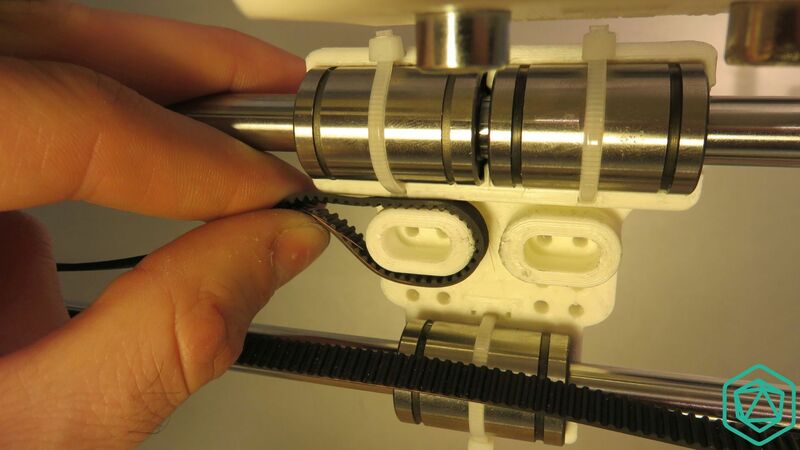 Take one end of your belt and push it inside the tight gap dedicated to keep the belt into position, between the 2 linear bearings.You might need to force a little bit so that the belt is slightly smashed between the plastic. 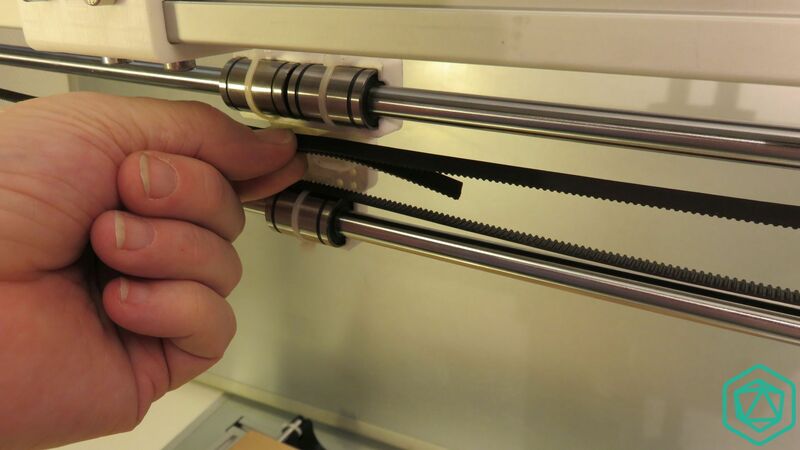 You can use your nails to push the belt up to the end of the slot. 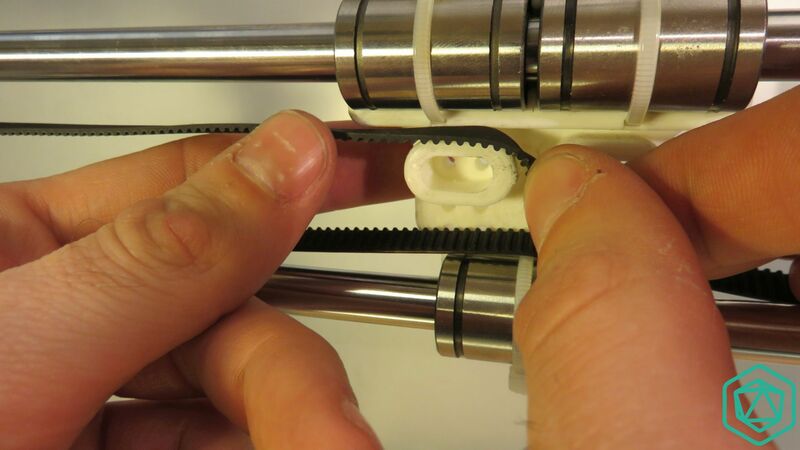 Then round it so that the belt teeth can join. 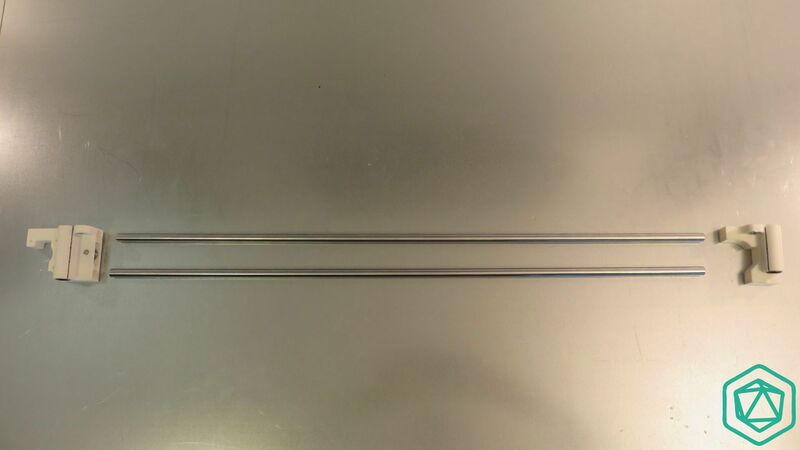 make sure you have extra length, you will need it to secure the belt later on. Do the same on the other side of the belt. At this moment try to pull the belt a maximum already so that it’s quite stretched . Whatever you do, the belt will keep a small flexibility. It’s normal, the side stretcher will cope with that later on. 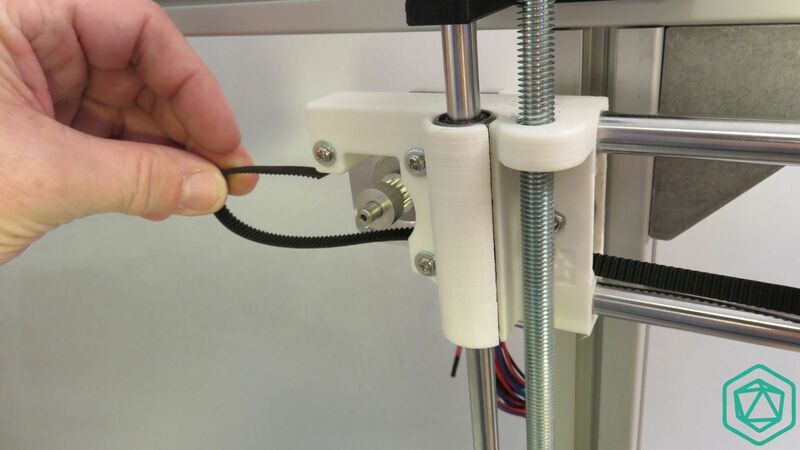 Insert a cable tie and start to close it but keep it loose. 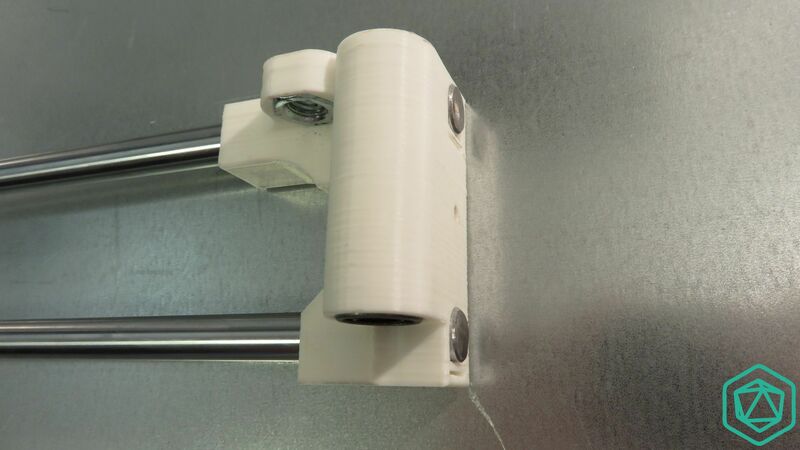 One side of the belt must fully be inside the closing cable tie. 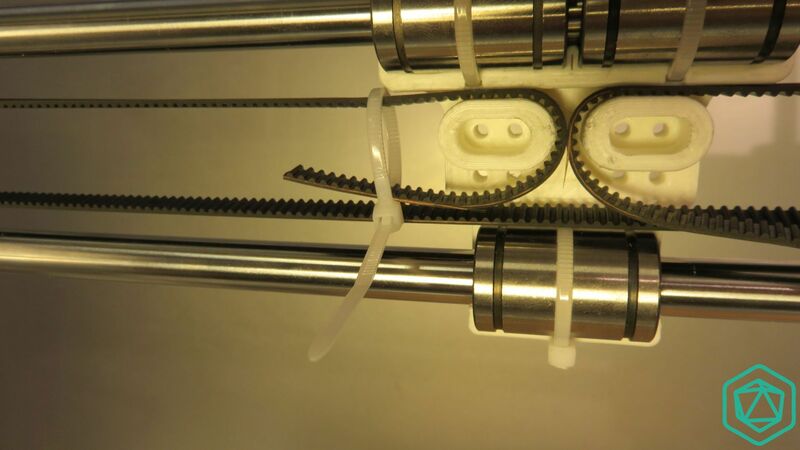 the picture illustrate this..
Now close the cable tie but make sure the belt stay aligned and parallel to the smooth rods. 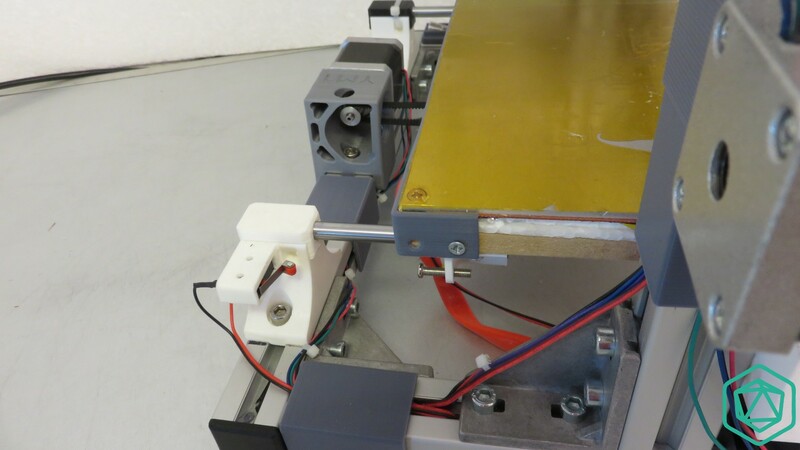 The belt must always be aligned at the top to keep the mechanical motion of the carriage linear. Do the same with the other side of the belt. Once finished it should look like the photo. Take a screw diver and stretch the belt max . 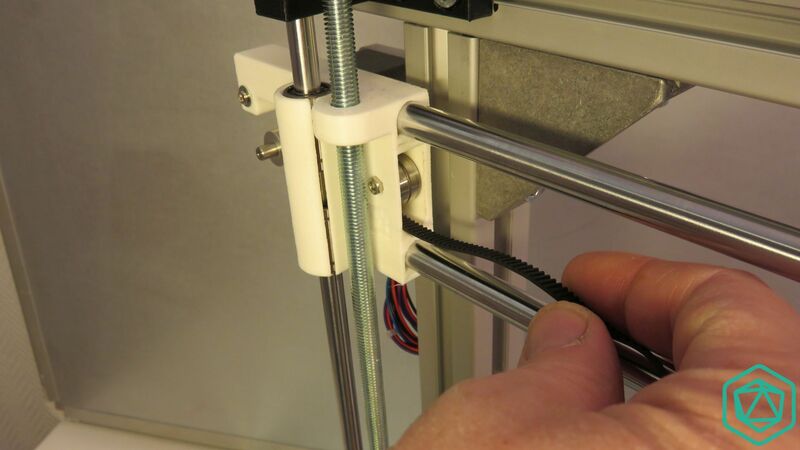 Make sure not to bend the Z axis however. You know that your belt is stretched when it seems very hard by pressing on it. Considering the length of the belt, even when properly stretched, it might still seem a little bit flexible or might vibrate a little bit. 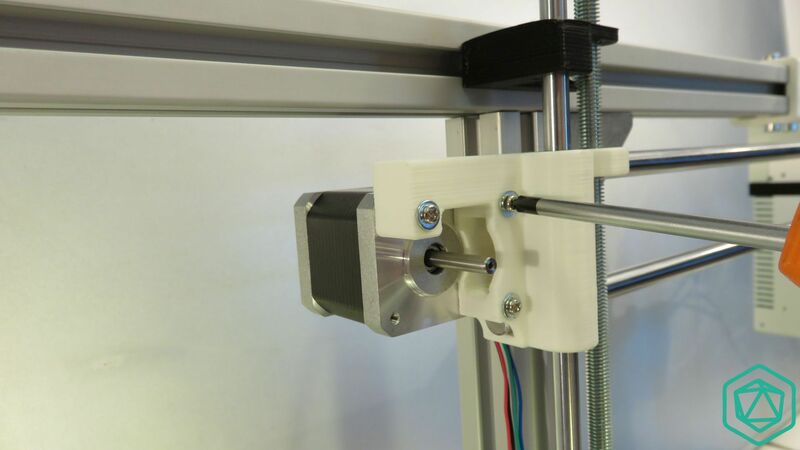 It’s normal it shouldn’t bother that much the printing but might impact the maximum acceleration you can use on that axis. 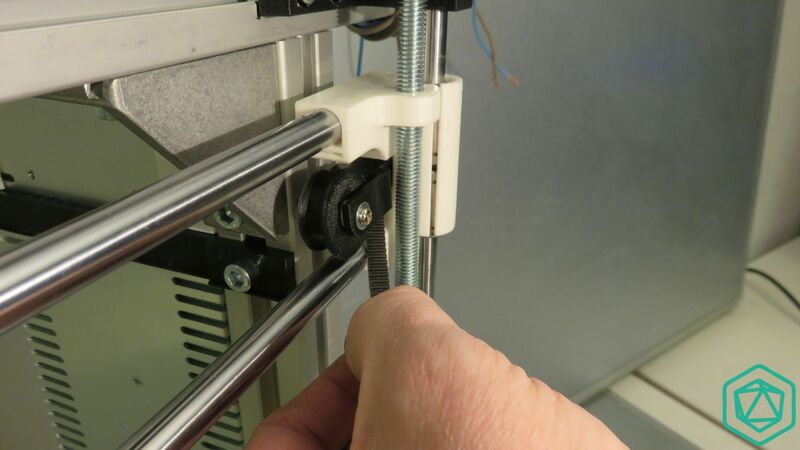 Cette entrée a été publiée dans Axe X, Imprimante Scalar, Imprimante Scalar X10, Imprimantes, Scalar XL, et marquée avec belt, carriage, fork, Idler, installation, motor holder, setup, X axis, le 15 May 2015 par 3D Modular Systems. 2 tiges lisses de 10mm de diamètre et 660mm de long. 2 tiges lisses de 8mm de diamètre et 435mm de long. Approchez les barres de la pièce plastique. 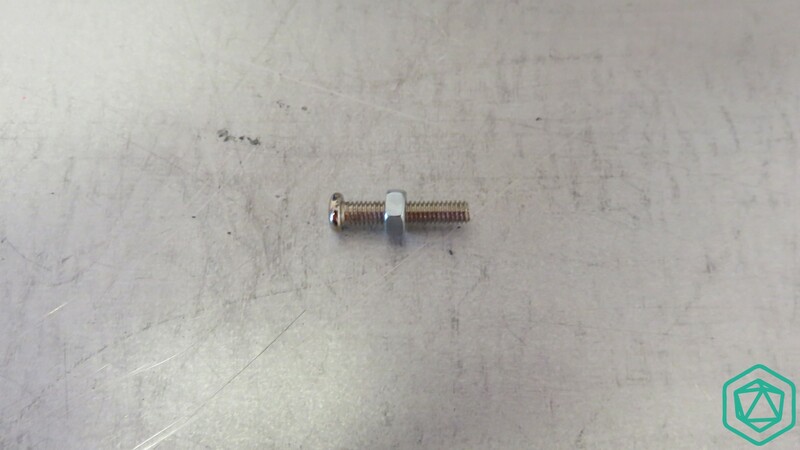 Ici la photo d’une barre complètement rentré et la deuxième en cours d’insertion. Une fois les deux barres complètement insérés, vous devriez obtenir quelque chose semblable à la photo. Notez que sur la photo, le haut de la pièce se trouve en bas de la photo. Scalar XL: Une fois les deux barres insérés dans la pièce XMII 10, veillez à insérer 2 roulements LM10UU sur la tige du haut et un roulement sur la tige du bas. 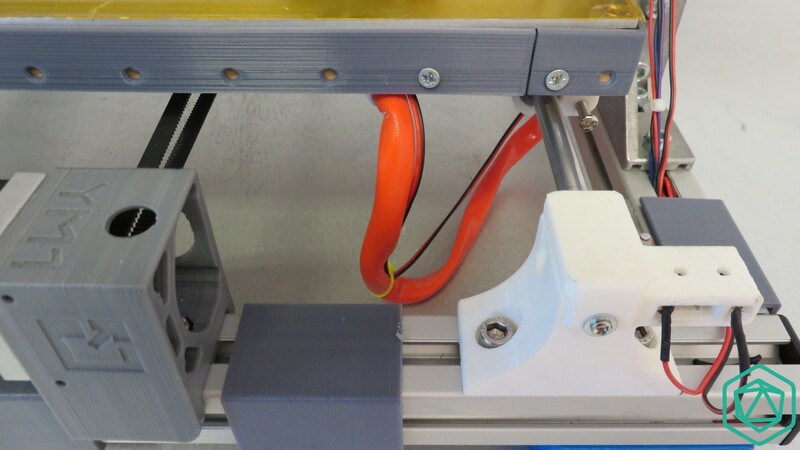 Scalar M: Une fois les deux barres insérés dans la pièce XMII 8, veillez à insérer 2 roulements LM8UU sur la tige du haut et un roulement sur la tige du bas. La partie haute de la pièce correspond au haut de la pièce quand le marquage est lisible à l’endroit. Sur la photo précédente, cela correspond au bas de la pièce. Scalar XL: Une fois les roulements insérez, vous pouvez prendre la pièce XMI 10 et l’insérer à son tour sur les 2 tiges lisses. Scalar M: Une fois les roulements insérez, vous pouvez prendre la pièce XMI 8 et l’insérer à son tour sur les 2 tiges lisses. Cela devrait être plus facile à faire de ce côté là. Une fois les tiges insérées vous pouvez poussez la pièce plastic jusqu’à fleur des tiges lisses. Vous pouvez vous aider d’un marteau afin de pousser la pièce plastique. Tapez des petits coup sec au milieu de la pièce! Voila le résultat une fois la pièce montée. 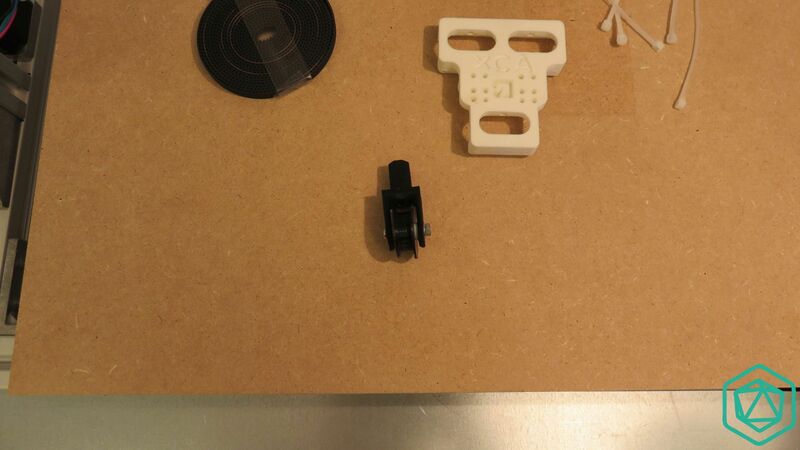 Axe X pour le kit pré assemblé. 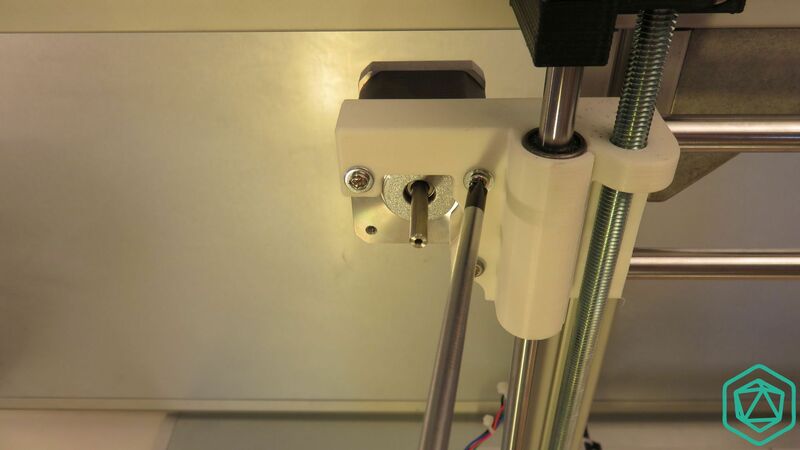 Cette entrée a été publiée dans Axe X, Imprimante Scalar X10, et marquée avec Axe X, LM10UU, scalar, smooth rod, tige lisse, X axis, X10, XMI, XMII, le 5 March 2015 par c.bonfils.